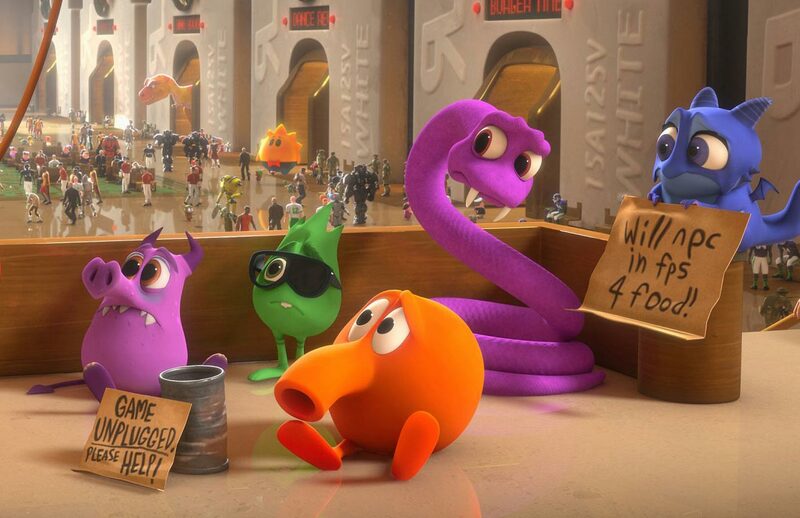 Disney’s latest animated film, Wreck-It Ralph, feels a lot like a mashup of Who Framed Roger Rabbit? and Toy Story by way of Tron. Set inside the world of arcade games — 8-bit and otherwise — it tells the story of Ralph (voiced lovably by John C. Reilly), the villain of a Donkey Kong–like game called Fix-It Felix Jr. After 30 years, Ralph is in a funk. He’s grown tired of being thrown off a building over and over again, living in Felix’s shadow, and being the bad guy in a town called Niceville. “It’s tough to love your job when nobody likes you for doing it,” he tells his support group. Wanting to prove there’s more to him than just destructive tendencies, Ralph “goes Turbo” and leaves the game, heading off to the after-hours Game Central Station where folks like Sonic the Hedgehog, Pac Man, and Q*Bert mix and mingle, and into other games, like the violent futuristic war game, Hero’s Duty. But of course, things don’t go as planned, and after battling against “Cy-Bugs” alongside Sergeant Calhoun (Jane Lynch), Ralph finds himself in a kids game called Sugar Rush, where he meets young Vanellope von Schweetz (Sarah Silverman), a glitch whose fate could affect the entire arcade. It’s a great premise, and with a bright, candy-colored landscape that includes Nesquick sand (get it? get it?) and palace guards who chant, Wizard of Oz–style, “Oreo, oh oh,” Wreck-It Ralph is a frenetic feast for nostalgia buffs, animation fans, and moviegoers of all ages. So, fine. 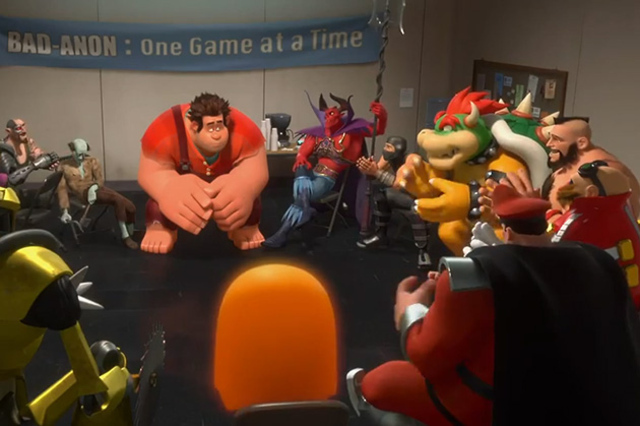 Wreck-It Ralph is kind of like a movie for people who thought Cloudy with a Chance of Meatballs needed more Nintendo and Sega references. 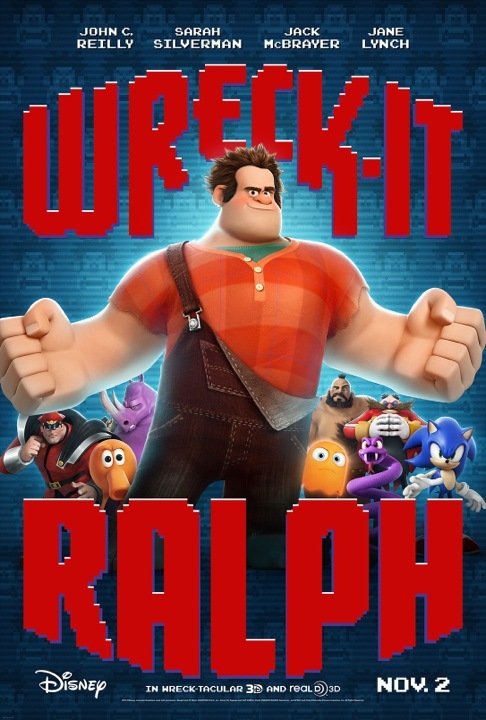 That’s not exactly a bad thing, but it doesn’t make Wreck-It Ralph a total winner either. I’m giving the film a B+. What was your favorite arcade and/or video game when you were a child? Share your thoughts in the comments section below.